San Antonio Real Estate Investors Association - Monthly Meeting - "How to Buy Tax Foreclosures Before the Competition with Special Guest Bexar County Tax Collector Albert Uresti"
Monthly Meeting - "How to Buy Tax Foreclosures Before the Competition with Special Guest Bexar County Tax Collector Albert Uresti"
Real Estate attorney, investor, broker, and president of SAREIA, Victor Maas, will be discussing how to finance deals. As many of you know, Victor has been investing in Real Estate over 15 years. In addition, Victor has closed 100's of transactions ranging from Sub-2 deeds to full blown rehabs. 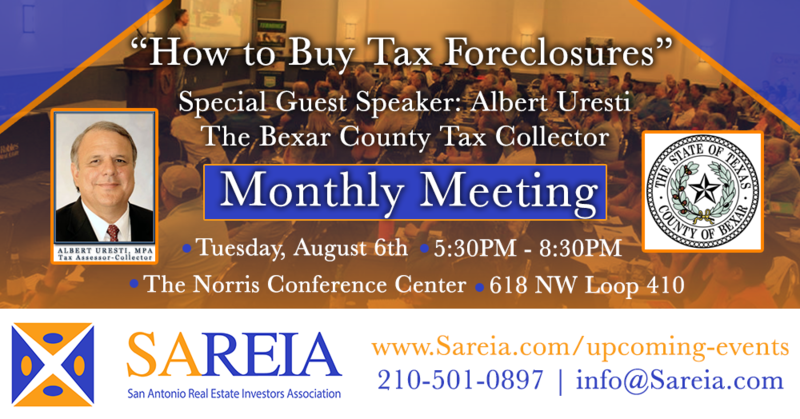 Bexar County Tax Collector Albert Uresti will be discussing the property taxes and the tax system, as well as bring a guest from the Linebarger Law Firm with him to discuss how to buy tax foreclosures. The Linebarger Law Firm is responsible for putting out the list of properties that are tax delinquent. Tax foreclosures tend to have motivated sellers, this is why so many investors pursue properties like these.